Helen Aardsma is a happy (and very busy!) stay-at-home mother of ten children. She manages Mulberry Lane Farm and home-schools her two children who are still at home. She is grandmother to 21 grands, as of January 2015. For nine years she wrote the bi-weekly publication The Mother's Companion to encourage Christian women in the art of mothering. 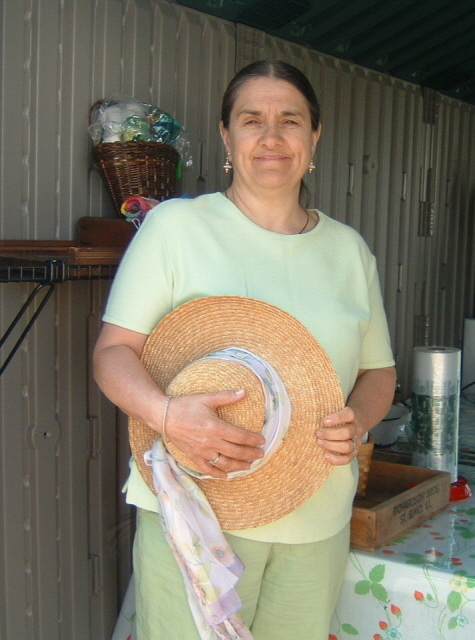 Helen Aardsma in the garden stand. Spring 2008. Helen says: "God has blessed me with a godly, loving husband, Gerald, and ten wonderful children. Our children range in age from fourth-grader to a married adult with four children. Grandchildren are being added almost yearly, with eleven so far! Home schooling has been a part of our family since 1982. "In January, 1995, we left southern California and moved to central Illinois so my husband (a Ph.D. scientist) could pursue his research in biblical chronology full time. We practice a simple homesteading life-style in the country. "I like gardening (flowers and veggies), walking with my hubby, hanging out laundry, reading old books, mentoring young mothers, living in the country, my Bosch bread maker, home-grown heritage turkey, listening to my daughter play the piano, Elisabeth Elliot, garage sales, leisurely Sundays, cast iron, large vans, chocolate, blueberry goat's-milk milkshakes, thrift stores, baby slings, Saturday evenings when my house is clean(er? ), my answering machine, the smell of home-made whole wheat bread, stainless steel, dishwashers, mail-order shopping, warranties, my Retsel grain mill, teenagers who can drive and run errands for me, and libraries. "I dislike water on the bathroom floor, diets, plastic, white walls, lost library books, malls, finding my silverware outside, water on the kitchen floor, store-bought fruit and vegetables, laundry piles, adult-only church services, store-bought white bread, white T-shirts, questions like, "Are they all yours? ", white socks, crying babies, sassy children, TV, white anything, lost shoes, and the flu."